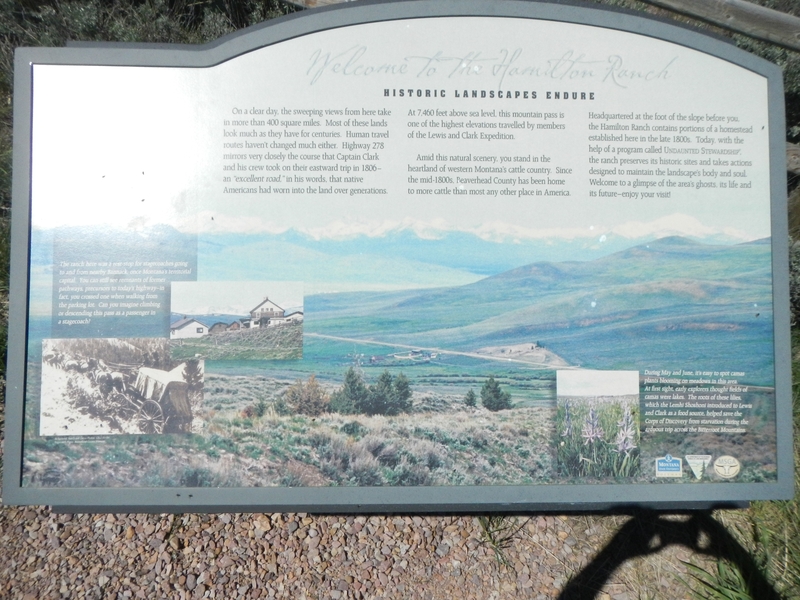 Additional Description: Captions: (lower left) The ranch here was a rest stop for stagecoaches going to and from nearby Bannack, once Montana's territorial capital. You can see remains of former pathways, precursors to today's highway - in face, you crossed one when walking from the parking lot. Can you imagine climbing or descending this pass as a passenger in a stagecoach! ; (lower right) During May and June, it's easy to spot camas plants blooming on meadows in this area. At first sight, early explorers though fields of camas were lakes. The roots of these lilies, which the Lemhi Shoshoni introduced to Lewis and Clark as a food source, helped save the Corps of Discovery from starvation during the arduous trip across the Bitterroot Mountains. Submitted: October 4, 2018, by Barry Swackhamer of San Jose, California.